U.S. 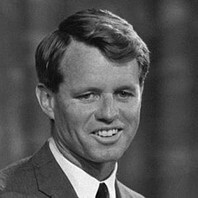 Senator from New York and Attorney General under his brother John's administration who was assassinated in 1968 while he was running for president. He spearheaded many of the civil rights initiatives that the Kennedy Administration put forward. There hasn't been a nuclear plant proposed since 1973 ... and the reason for it is because it is just not economical, ... It still requires huge government subsidies to make it work and we still don't know what we are going to do with the waste for the next thousand years.